MANILA, Philippines – For the first time in 40 years, the late dictator Ferdinand Marcos’ full television broadcast on September 21 declaring martial law was aired a little after 7:15 on on September 23, or “exactly 40 years to the date and time of the original broadcast in 1972,” the government said. Martial law led to two decades of brutal rule. Newspapers and television stations critical of Marcos were shut down or taken over, while critics and political opponents were killed. Showing the speech in full ensures the public will “never forget” the atrocities during Marcos’s rule, which was marked by widespread human rights abuses that saw hundreds of activities killed, jailed or abducted by the dictator’s forces, the office of President Benigno Aquino said. Marcos signed the martial law order on September 21, 1972, but officially announced it to a shocked Filipino public two days later, or on September 23. 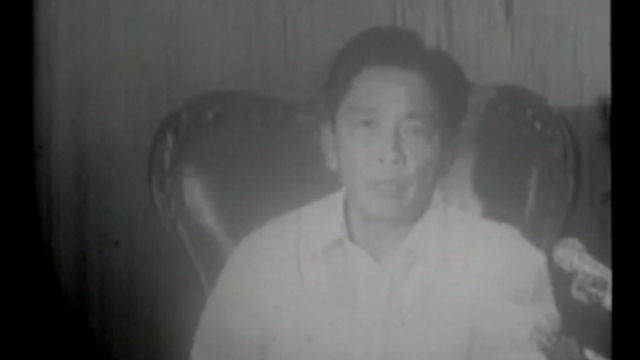 The video was from the archives of ABS-CBN, the Philippines’ leading private broadcaster once padlocked by the Marcos regime. The government has also posted online contents of Marcos’s personal diary, giving a rare glimpse into the mind of the dictator as martial unfolded. In his diary, Marcos wrote how his forces immediately arrested 52 personalities out of 200 targets, which included opposition figure senator Benigno Aquino — father of the current president. “At 7:15 pm I finally appeared on a nationwide TV and radio broadcast to announce the proclamation of martial law, the general orders and instruction,” Marcos wrote. Aquino was subsequently allowed to leave the country to seek treatment in the United States for his ailing heart, but was shot at the tarmac of the airport in 1983 upon returning him. Anger over his death snowballed into a people power revolt 3 years later that finally ended Marcos’ regime, and installed as president Aquino’s widow, Corazon C. Aquino. Aquino’s son and namesake, Benigno Aquino III, became president after winning election in 2010. “It’s a very nice resource for you to understand and to be aware of what happened in those times,” presidential spokeswoman Abigail Valte said, referring to the site put up to collate historical materials from those dark days of the country.